… anyone care to guess my favourite garden colours? well, let’s just say that I had a strong sense of dejá vu on Friday night. There was … ahem … movement at the station … there was cramping, weakness, there was bleeding, there was general unpleasantness and I was very definitely in shock at one stage. No sleep was had and anyone suggesting that the hours before dawn were a tad nasty would not be accused of exaggeration. As with last time, an early phone call to Robyn saw her come to my rescue via the pharmacy and the rest of Saturday was spent in my jammies, on the couch under a quilt, apart from the inevitable dashes to the bathroom. Lisette was supposed to be coming up from Melbourne with kidlets but there are some things that it isn’t necessary to inflict on your friends, so we put the visit off until today. Thanks to the wonders of modern pharmacology I was feeling fine, even though I possibly didn’t look it. Lisette and the kids duly arrived, albeit later than planned, armed with bikkies, much needed margarine – which I just realised I forgot to pay her for – and a couple of wee baggies of English Leicester fleece: one au natural and one dyed a deep coral. …and after making the acquaintance of my menagerie, we hiked over to PNDs so that the new puppies could be cuddled and the mini horses patted and admired… and yet more goats fondled. … then I was given the opportunity to buy / rescue Rosie, and so a goat shed became something of a necessity. It was done fast and cheap with what was on hand or could be scrounged, and looked as though a strong puff of wind might bring the roof down but it did the trick. and then Rowan and Ruby arrived. On Wednesday, Robyne and Paul [ he who gives my girls their periodic pedicures ] came over for the day and Casa Caprine has sprouted a whole new extension. I didn’t think to get any shots of the man at work [ bad blogger … BAD ] but here’s Rob [left] and Jeanette [“do you have to do that?” yes, Jeanette, I do ] who popped in to knit with us for a while and stayed for some lunch. There was knitting, crocheting, quilt talk, cat cuddling, many cuppas, all in a nice warm house while Mr Independant banged and crashed around and generally had a wonderful time. >You know that thing where you have hand washed a piece of knitwear and you roll it up in a towel and stomp the bejesus out of it to remove as much water as possible? and then you probably do it again in a dry towel? Yeah, thought you did. Anyway I was wet blocking some knitting and Sophie pointed out – as tactfully as she could – that she was of the strongly held opinion that I had left too much moisture in there, and shouldn’t someone do something about it? >So my darlings, when last we saw each other, I had been ensnared by those dastardly mucous elves and they had finally managed to grab a hold of David as well. The revolting but highly effective hallucinogenic cough syrup was flowing freely, the throat lozenges were being consumed in epic quantities, the fire was … well… fired up, and we were settling in for the weekend. I was seriously considering whether or not I should pass on the ‘Made In Ballarat’ concert for Sunday… partly because of the unstoppable paroxysms of coughing – always embarrassing at these events – and partly that whole maternal thing of not wanting to leave David when he’s unwell. Yes, I do realise that he’s nearly 30, but in terms of being able to communicate how badly he is feeling, think average toddler. My head was saying that Graham the Carer knows him and is a fabulous bloke, but that whole mother thing was kicking in big time. … and of course on top of all that, on top of wanting to see Corrie, and the concert, there was the long looked for chance to finally meet Alice, frequent commenter on this ‘ere blog who was driving down from interstate for the occasion. Saturday night saw David and I engaged in a contest to see who would be first to cough up a lung. Not a lot of sleep was had. Sunday morning dawned and as I struggled out to feed the goats, followed by 5 fairly vocal felines, I was starting to rethink my decision to go. I felt … and looked … like something that the cats would’ve refused to drag in. …but by 1pm by the grace of a hot shower and large quantities of every cough and cold medication known to humankind, I was dressed, presentable – sort of – and ready to drive nearly 100 km over country roads. Probably just as well the local constabulary were not in evidence. I’m not entirely sure that huge volumes of Hallucinogenic Cough Syrup does a lot for one’s driving skills. Fast forward to Ballarat and me walking out of the car park and as I glance at the passenger of the oncoming car, she looks vaguely familiar. It’s Alice… I think… not sure what with the HCS and all … but I smile anyway … hoping that it is, in fact, she and not someone entirely different who is going to worry about the strange purple haired woman grinning inanely in her direction. I’m not going to give you a blow-by-blow of the concert which was very good and very long. who perhaps overdid things a bit as evidenced by a dreadful crack in his voice at the end of the last number : the beautiful duet ” Au fond du temple saint” from Pearl Fishers. This was sung with Roger Lemke another Ballarat born and bred opera singer but of the baritonal persuasion. 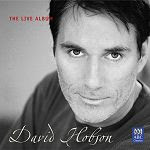 The very first time I heard David Hobson sing was at an Australian Pops Orchestra concert back in about 1989, also with Mr Lemke … they sang that very same duet and I was hooked. there was some general milling around in the foyer afterwards and before we all headed out into the rapidly darkening streets there was opportunity for some photographic efforts. and trust me, these were the GOOD photos !! >The code id da dose seems to be thinking about relocating… apparently somewhere in the region of my chest cavity holds great attraction. All those happy little mucous elves are packing their bags and heading south. Some of their relatives have struck out on their own and set up housekeeping over at Casa David so it could be an ‘interesting’ weekend. David off-colour is not fun. I can’t possibly be out working the acreage in bitter winter temperatures with a hacking cough – can I ? and now that that I’m past the ‘just-let-me-die’ stage, I am finding the idea of yarny pursuits quite compelling. shouldn’t take toooooooooo long to do 8 rows of border … should it? I think maybe I remember part of why it went into hibernation in the first place. ‘The Colour of Magic’ arrived from England today, so one way or the other I’m set. Reasonable prices, fast FREE worldwide delivery – England to Australia in around 7 – 10 days, except that this time it was only 5 ! !